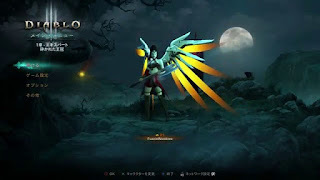 The awesome-looking Falcon Wings are one of the cosmetic extras introduced by Diablo III's patch 2.4.1 and while they are difficult to get, for someone who knows where to look and what to do, it should be fairly easy - if painstaking- to pick them up. The first thing one needs to know is where to look. The scene of this heist is Act 4 Gardens of Hope Tier 1, and its objective is the Mysterious Chest. While it is exactly like any other chest in the game, save for its actual name, the Mysterious Chest is quite peculiar in the sense that it doesn't show up on the mini-map. One actually has to visually survey his/her surroundings for it. The other peculiar feature of the Mysterious Chest is that its spawning is 100% luck-based, which means one may happen upon it on his/her first try, but some farmers have been known to persist for 8 hours in its hunt. The good news is though that once it shows up, the Mysterious Chest guarantees a set of Falcon Wings: all one has to do is to open it and to pick up the goods. Needless to say, farmers have already optimized the Falcon Wing hunt process. There's a recommended build for it, the Speedrun build, which allows one to quickly explore the entire map and then to get out and jump back again if no Mysterious Chest lands. It is good to know that one doesn't have to kill off all the monsters to get to the Mysterious Chest. Some players have also begun drawing up a sort of map of the most likely spawn locations of the coveted chest, as it is logical that there are a limited number of such spots. Difficulty does not seem to play any role in how often the Mysterious Chest spawns. Having been involved in e-Sports for about a decade now, Philip Thalberg is a GosuTeam member and a Dota 2 enthusiast.